We’d love your help. 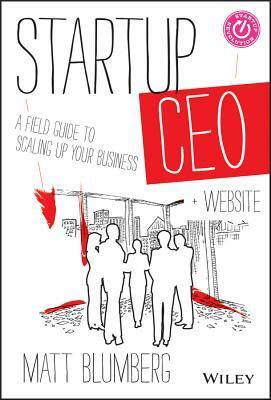 Let us know what’s wrong with this preview of Startup CEO by Matt Blumberg. A definitive book for any CEO--first time or otherwise--of a high-growth companyWhile big company CEOs are usually groomed for the job for years, startup CEOs aren't--and they're often young and relatively inexperienced in business in general. Author Matt Blumberg, a technology and marketing entrepreneur, knows this all too well. Back in 1999, he started a company called R A definitive book for any CEO--first time or otherwise--of a high-growth companyWhile big company CEOs are usually groomed for the job for years, startup CEOs aren't--and they're often young and relatively inexperienced in business in general. Author Matt Blumberg, a technology and marketing entrepreneur, knows this all too well. Back in 1999, he started a company called Return Path, which later became the driving force behind the creation of his blog, OnlyOnce--because "you're only a first time CEO once." To ask other readers questions about Startup CEO, please sign up. I am rating books in a manner that should help others to decide wheather to read one or not. I give this one a 5, since I believe that everyone even remotely engaged into running a startup/business will find this book helpful and worth reading. You could basically print most of it, and put in on the wall as a TODO list for yourself. It's got everything you need to know to be a ceo. It also lets you know how hard it is to be a ceo. Good to read for any leader in a company to understand more about how a company should be run. I really want to be able to strongly recommend this to most of the startups I work with on a daily basis, but it's not for early stage startups. I have to keep in mind that this series of startup books originated with Brad Feld from Foundry Group, a venture firm that invests in Series A & B rounds. The vast majority of the startups I see and work with are at the angel and seed level of capital and growth. As such, advice such as annual 360 reviews is not the most critical advice I would offe I really want to be able to strongly recommend this to most of the startups I work with on a daily basis, but it's not for early stage startups. I have to keep in mind that this series of startup books originated with Brad Feld from Foundry Group, a venture firm that invests in Series A & B rounds. The vast majority of the startups I see and work with are at the angel and seed level of capital and growth. As such, advice such as annual 360 reviews is not the most critical advice I would offer early stage startups. The title may have been better as "Scale-up CEO" and targeting companies that have found a scalable, repeatable business model. Strong and specific discuss of being CEO of a startup. He gives you enough info to be practical and then points you to books and people who can help you go deeper in area, if you want. I loved all his points. My only note is that it’s very much for a startup that has major investors. A large portion of the book is focused on things like investor board and stock options. So if that’s not your approach, then you’ll have to skip a good chunk of the book. This is a great book for one who's starting a business, startup or not. Inside you will find many starting points to be a better CEO. More than taht I felt more conscious about the complexity of being a CEO. A great book for anyone in a leadership position. There are heaps of great idea's in this book covering all important aspects of running a business. Stop what you're doing and start reading! I generally listen to books while at the gym and this audio books is divided into two sections which are each a little of 6 hours long or a lot of treadmill time. The book had its moments, but far too often felt like as advertisement for ReturnPath or Brad Feld. I guess this makes since to prop both up, but it got old and fast. I much prefer more info and I just did not feel like I got enough. The first half just never grabbed me at all, but the second half had lots of thoughtful info and suggesti I generally listen to books while at the gym and this audio books is divided into two sections which are each a little of 6 hours long or a lot of treadmill time. The first half just never grabbed me at all, but the second half had lots of thoughtful info and suggestions. The second half also seemed to get away from the pitch for ReturnPath and Brad Feld a bit with more of a focus what the title of the book suggests. This was a good, solid book about leading a start-up. I think it serves better as a reference manual than as a business text that you would want to consume in one sitting. He gives good advice about a large number of issues that CEO's (and other execs) face at one point or another. I could see myself returning to this when, say, I'm beginning to plan our next executive offsite, or if we're having problems with a member of the BOD, etc. Matt's a veteran entrepreneur and his book is a gift to CEO's everywhere. Many management books only focus on big company leadership issues. Many entrepreneurship books focus only on very early stage businesses. Startup CEO walks you through the entire growth lifecycle of running a business. Plus, it's organized in easily digestible, standalone chapters that contain concise and actionable perspective and recommendations. If you're leading a company, this is a book worth making time for. Read this on my Kindle and it's the ideal format, as I made a ton of highlights for practical info (board meeting agendas, executive assistant job descriptions, etc.) I'll refer to later. Strongly recommend reading this in Kindle/digital format so you can highlight, and NOT as an audio book, due to the reference material contained within. Excellent read. It starts out slow with business model and idea validation subjects I didn't enjoy that much. But from there onwards it's a roller coaster of deep content about all areas the CEO operates with, ranging from boards to assistants to employees to compensation and bonuses. Well rounded and deep book. To re-read! Exactly applicable to what the title states. I especially like the last little chapter that includes comments from his wife (apparently this is the tip of the iceberg for another book: Startup Life). Appreciate the effort the author put into it. A great book, reference, guide for anyone who finds himself in the position of building a company. Read it on the Kindle but bought the print version just so I can have it on my desk to thumb through whenever I need it. One of the best and clearest guide I've ever read. The author gives valuable insights and how-to advices on how to run a fast-growing company effectively. This is a great read for any leader particularly the CEO in a start up. This book was much longer than I anticipated, but that is a good thing. It was jam packed with useful information and gave a clear picture of what the Startup CEO world really looks like. Absolute essential read for any startup CEO or co-founder. It really walks you through everything you can expect and how to deal with it. Must read for anyone in business period. This book has advice that is aimed at startups and new ventures but its lessons are broadly applicable. Really good: the basics from an experienced techo CEO. I would call it: the básico guide to run your silicon valley startup. Must read. If you want to or have already become startup CEO, I would strongly recommend you to read this book. It is written by someone who has been start CEO. The experience he shared is valuable. A really great overview of what it takes to run a startup. I especially liked the sections on setting up a personal operating system and working with an assistant.